Thinking about trying circus arts for the first time? 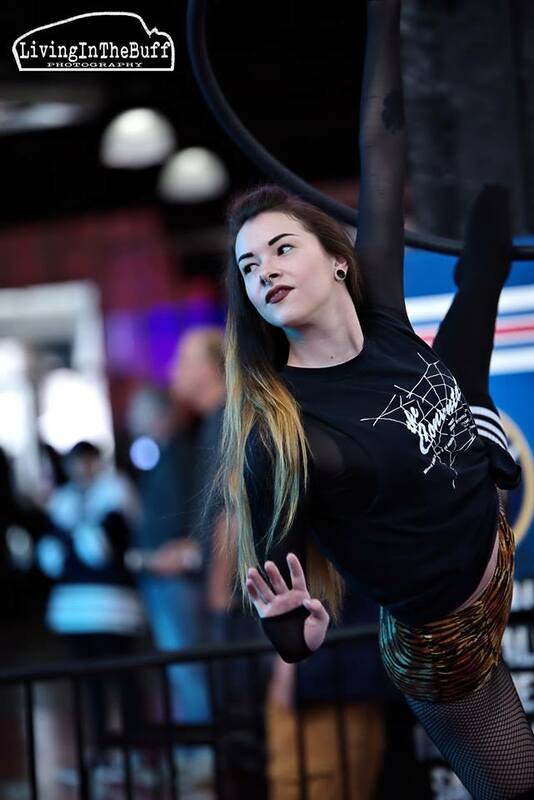 Read about how our Lyra instructor Samm began as a new student, grew to love aerial dance, and found a home in the circus. If you’re reading this, then you might’ve caught the bug. The circus bug. You know when your hands are just itching to climb on that apparatus (or another person) and for a little while you can forget everything about whatever is stressing you out that day, and get inspired by the positive vibes of accomplishing something. If you’re new to circus arts, you also know that magic feeling has its repercussions, sore muscles in the strangest places, bruising, scrapes, being bummed out when you can’t seem to figure out a move no matter how much you practice. It’s important to remember, we were all new to this once. Believe it or not, your instructor wasn’t born doing a toe hang, or a Russian split, or crossback straddle. Everything we do in this art form requires patience, training, and the knowledge that we will likely fail many times before we achieve our goals. For our newest recruits to this cult we call circus arts, I thought I’d give you some perspective on my journey, which will hopefully inspire yours. I’ll preface this by saying, I have my own goals that I have not yet met. I have good days, and bad days, and lazy days, and everything in between. Sometimes things just work, and I surprise myself, but many times they don’t. My aerial training is a constant work in progress, and I am far from perfect. I would’ve never started down this path if I hadn’t just decided to take a chance. That’s how it is for many of us- we just made the decision to try. In my case, I was working an office job, completely out of shape without any real desire to do much about it. I joined a gym, and I went jogging on the treadmill once a week for about a month- and never went back. I did some dvd-style workouts… and hated them. I couldn’t stick with anything. I didn’t think much about it again until I saw a social media post about there being some circus sampler classes in my area, and I thought, wow I wish I could do something like that. I used to dance, ballet and jazz mostly, and something about seeing people so high in the air dancing on fabrics was mesmerizing. But certainly not for me. I mean, I’m afraid of heights. But I couldn’t get the idea out of my head. I asked some friends if they wanted to try it out with me, and no one was brave enough, so I almost let it go. I mean, I wasn’t going to go make a fool of myself alone, in front of strangers. That would be crazy. It was a week later that I was out of town, we’d gone to a renaissance festival and we were strolling through when I stopped what I was doing. There were two girls, clad in gorgeous leotards and they were my size. More fit, obviously, but not in a totally un-relatable way. They certainly didn’t look strong enough to climb those red silks, or pull off the amazing feats of strength and grace while I watched. I saw that, and made up my mind instantly; I’m going to that class and I don’t care if I go alone- I have to try this. It’s never as easy as it looks. I psyched myself up, and I went to my first aerial class. And I totally sucked at it. I tried silks, and I couldn’t climb at all. I tried trapeze, and I couldn’t invert without using my feet to latch on to the bar. I had zero upper body strength. This was hard. I saw other students succeeding and was so disappointed in myself for not being about to grasp these simple tasks. But I wanted it. I really really wanted it. I liked the feeling of moving again, like dance, but so unlike what I had known before. I saw the others trying their first moves, taking pictures of each other and giving high fives, and I wanted that feeling. I pulled myself out of my own head, and next week I was back. And I was determined. This time, I did better. I wasn’t any stronger than last week, but I knew what to expect. And this time, I got to try something new. I got to touch my first Lyra. I had tried the trapeze last time, and this was similar, but when I finally got to sit on it for the first time, I remember feeling as at home as a bird in a perch. That was it. Forget the other apparatuses, this was my new home. I wanted this feeling all the time. It was very matter of fact. She didn’t sugar coat it. I appreciated that, I knew I had a long road ahead of me, but just having that glimmer of hope was enough. It wasn’t impossible. If I worked hard enough, I could do this. Full of newfound determination, I bought a pull-up bar, and started conditioning myself. I started with baby pull-ups and chin ups, with my feet on the ground and only taking some of my weight into my hands. My lyra instructor encouraged me, showing me low weight exercises to help me increase my strength. I attended the sampler classes for a month and half.. practicing the same moves, but now, I was the one other students were would look to- instead of the other way around. That simple transformation was so gratifying. I was slower than the other students to start with, but determination and practice were all I needed to succeed. Of course, as a student, every time you think you’ve mastered something, you get hit with a reality check of how much you don’t know. I eventually progressed into a more advanced class, and again struck by feelings of inadequacy. These were students with a year of previous silks experience, in a Lyra class. I couldn’t compare strength wise. When they did their conditioning on apparatus, I did modifications on the ground. I was really hard on myself then. Luckily, my fellow students recognized where I was at. I was surrounded by positive, encouraging people that I now count among my closest friends. They didn’t let me berate myself for not getting something right. It was such a change in attitude for me. All fitness aspects aside, I think the most beneficial thing for me on this journey has been learning to let myself off the hook. Understanding that no one is perfect all the time, we all have challenges and that you can face them with a positive attitude and support others in the same way. With the support from my instructor, my fellow classmates, and a lot of extra training- I got there eventually. And to my surprise, we each found things about Lyra that were unique to us. While one student might have superb balance, another might have a brain for the mechanics of a move. For me, I learned that I loved spinning more than anything else. These little discoveries helped us learn and develop our own unique style, and ultimately, is what sets us apart as performers, teachers, students, and artists. If you’re new to any circus art, I wish you the best of luck. Cherish this experience, give yourself a break and allow yourself to fail. Celebrate with friends when you succeed. When you’re the artist that others are looking up to, encourage them. Pass on knowledge. You’re going to have a bad day. You’re going to have great days. You may fall out of training for a little while and that’s okay. Come back when you’re ready, and listen to your body. And lastly, enjoy yourself. Sometimes we forget, as we progress and advance through classes, and our training becomes more serious, that we’re supposed to be having fun. If your performing, perform because you want to. Love what you do. Don’t push yourself too hard, don’t ignore injuries, and don’t compete with each other. I personally feel that is the true magic behind circus arts- passion, confidence, and community. Everything else is just glitter.